There is absolutely no doubt about the fact that WooCommerce is a vital and popular WordPress ecommerce plugin. The reason for it being preferred above many shopping cart development platforms is its flexibility, features as well as ease of use. The relationship or dependence of WooCommerce on WordPress can be considered as one of its greatest strengths. When it comes to web publishing solutions, WordPress is surely amongst the best and by relying on it, WooCommerce definitely inherits several of its features. For instance, video content has turned out to be a favorite among different online retailers for video product demonstrations which assists with shopping cart solutions. Videos can be easily added to WooCommerce products simply by placing the URL of the video within product description and it appears automatically inside the post. Videos can be embedded from different sources like YouTube, Viddler, Vimeo, Flickr, Instagram, Blip.tv, SlideShare, Twitter, Hulu, Imgur, etc. within WordPress. This feature is available in WooCommerce mostly because of its close connection with WordPress. However, there are plenty of ecommerce platforms that do not offer easy management of videos but present WordPress versions are available with this feature. Another highlight of the WooCommerce platform is that there are lots of themes available that support responsive design, indicating that adaption to mobile devices happen with ease. 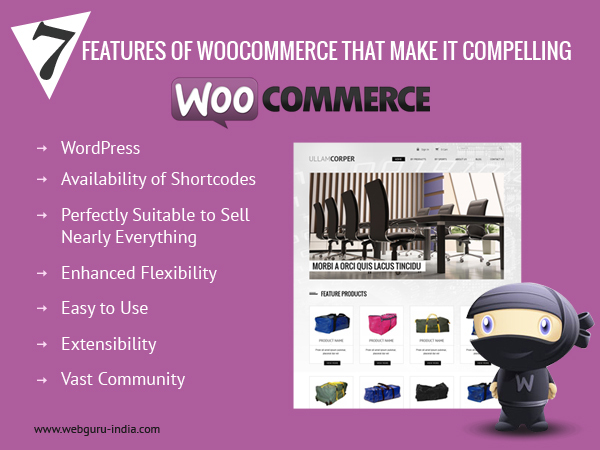 The theme compatibility feature of WooCommerce definitely makes it ideal for an online store solution. The WooCommerce templates integrate easily with majority of WordPress themes which has been chosen for a website. Merchants can even choose among several WooCommerce enabled themes, some of which are even free. After selecting a theme, changes can be made within the pre-set color themes and CSS styles and the code can also be tweaked to provide it with a personal touch. Shortcodes can be defined as pieces of text that are added to pages or posts. A function is invoked by these shortcodes that helps to add content. Different types of shortcodes are available with WooCommerce that assists with addition of products as well as ecommerce content to posts or pages. Shortcodes in WooCommerce can be used for inserting user account data, order tracking information, editing user accounts, changing password information and more. Merchants can use of this platform to sell almost anything they wish. Starting from selling of physical products such as computers, shoes, etc. to online services like custom video production or web design and even affiliated products, WooCommerce is undoubtedly a great solution for merchants. The product pages can be easily customized for listing details such as size, weight, inventory, shipping costs, etc. so as to make customers fully aware of what is being sold. Options like ShareYourCart and ShareThis allow customers to share the entire cart or a particular item with various social media networks. On top of that, the in-built analytics tool of WooCommerce helps to keep track of how an ecommerce website is performing with the help of simple pie graphs. The problem with majority of ecommerce platforms is that because of different reasons they do not offer enhanced flexibility when it comes to functionality and design as per the requirements of the user. There are some ecommerce platforms that are proprietary and offer merchants with certain limitations regarding what they can control and change. While, on the other hand some offer superior flexibility provided that merchants can easily grasp their theming structures and complicated database schemas. However with WooCommerce, developers get full control of the features and the functionalities. Starting from responsiveness to page layout to styling, designers can control nearly every aspect of the site easily without much of an experience. Installation and running of WordPress and WooCommerce can be completed in a few minutes even by people who do not have any prior experience in the process. The ease of use offered by WooCommerce helps merchants to get things working the way they want without any sort of trouble. The extensibility of WordPress and WooCommerce is a crucial factor behind their immense popularity. With the availability of numerous plugins, their functionality can be easily extended to assist users in a better way and provide them with an enhanced experience. WordPress as well as WooCommerce are both part a community extending worldwide. Users in the community ask questions, share their experiences and work towards improving the platform. Merchants using WooCommerce can benefit a lot from the community with the shared experiences of different users. The presence of a vast community certainly helps by providing readily available information which can prove advantageous to merchants in different ways. Online sellers nowadays can make use of various ecommerce platforms to address their needs. There are plenty of solutions available that can certainly provide businesses with just what they require for their growth and exposure. However, those who run online stores are bound to fall in love with WooCommerce with its easy to use features and availability of various themes.